[tie_index]Introduction [/tie_index]Travel Agent Association of India (TAAI) is the largest tourism organization in India which helps in the promotion and development of tourism. TAAI is the representative body of the travel industry of India, representing not only the interest of travel agencies but also of other segments of the tourism industry such as tour operators, hotels, airlines (international and domestic), transport companies, cruise companies, excursion agents and tourists guides who are its member. In 1949 ASTA organized a conference to discuss various issues and problems relating to the travel industry in the USA. It was attended by all the members over the world. Mr. N.J Katgara (died in 1997) was the first person from India who is participated in this conference. He was of the opinion that a similar association should be established in India to protect the interests of Indian travel agencies. In 1951, his dream turned into a reality when the ‘Travel Agent Association of India (TAAI)’ was established. The TAAI was incorporated on the modest scale and had only 10 travel agency as its members at that time. The organization now has a membership of about 2400 in more than 76 cities in India and 20 foreign countries. The TAAI logo represents the integrity, ethics, professionalism, service and financial soundness of the travel outfit. TAAI is a limited organization.TAAI headquarter is established in Mumbai. To protect the interest of Indian Travel Companies. To organize training and development programmes for the members. To provide the means for collaboration. To develop and promote tourism. To provide timely, up to date and reliable information to the members. The ministry of the Tourism, Government of India and State Tourism departments recognize the representative character of TAAI and the company is consulted in each issue that has a direct or indirect impact on tourism. In fact, the department of tourism, ITDC, and State Tourism Corporations are its members. The company has consultative status with the ministries of External Affairs, Civil Aviation, Finance, Transport, Railways, and Home Affairs. The Travel Agent Association of India plays an important role in the field of travel and tourism in India. TAAI promotes and develop tourism, helps in collaboration and protect the interest of Indian Travel companies in India. TAAI is a tourism organization and any organization/firm and agency can apply for its membership. They have an IATA license. Have approval from the Department of Tourism, Government of India. Recognized by the Ministry of External Affairs. Functions successfully for at least one or two years. The associate members of the company are airlines, railways, and branches of travel agencies. Associate members are those who support the travel and tourism industry in the backend. These are vendors or suppliers of tourism products. The application for the membership is routed through the Regional Travel Agents Association which make recommendations to the central management committee after the due scrutiny. The process is essential to protect the name and logo of TAAI and its membership. The recommendations of the regional committee are necessary for the membership. 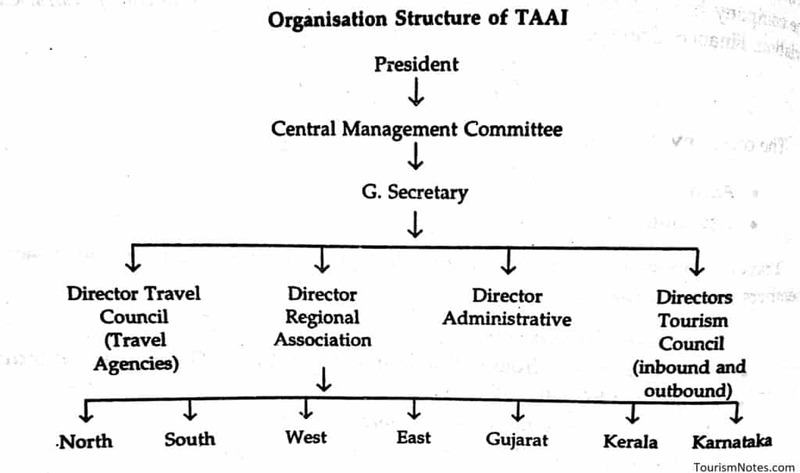 The activities and functions of TAAI are managed/operated by the central and regional management committees. Presently, TAAI has three regional association offices in Calcutta, Chennai, and Delhi and has three more branches in Kerala, Gujarat, and Karnataka. TAAI’s constitution allows the formation of regional associations where there are more than 10 active members, to enable them to handle their local problems, issues, and other things. The system is more effective because each regional association has its regional management committee. They meet every month to discuss various issues and problems. The other activities and affairs are managed by the Central Management Committee. The president is the main authority of TAAI, who is appointed/elected by the active members in the annual general meeting. Many regions have sub-committees to ensure more effective implementation of policies and plans such as fellowship committee and P.R Committee of northern region etc. The travel agency business these days has gone much beyond than mere ticketing and reservation. It covers a wide spectrum of activities including tour planning, tour designing, tour marketing, coasting and pricing, travel insurance, foreign currency, travel guidance etc. Therefore, TAAI is in the process of surveying and identifying the genuine professionals to ensure the quality of services and also to meet the cut-throat competition within the trade. The role of TAAI thus, can not be underestimated to ensure fair trade practices, standardized services, and tourism promotion etc. Help in the promotion of inbound, outbound and domestic tourism. TAAI offers a common forum. TAAI provides professional help to its members. TAAI helps the government to formulate tourism policy. It provides up to date information about the industry. TAAI from time to time undertakes advertising campaign. It helps in maintaining a continuous dialogue with other tourism organization. TAAI keep the tourist away from unethical trade practices.